Highland-Milford’s boys cross country team is never far from the top. As Coach Brian Salyers likes to point out, his squad has placed in the top ten in the MHSAA Lower Peninsula State Finals Division 1 race during 15 of the past 16 years. In 2003-2004, they won back-to-back titles. 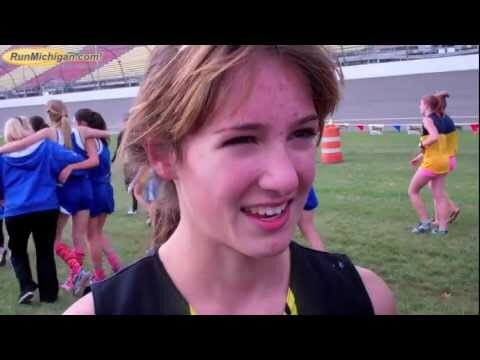 Julia Bos would have loved a big personal best to close out her in-state cross country career. She had to settle, instead, for merely a very dominant repeat victory in Saturday’s MHSAA Lower Peninsula Finals Division 2 race at Michigan International Speedway. BROOKLYN, Mich. – As the field at Michigan International Speedway Saturday made the big turn after the long starting straightaway, turning to cross the actual speedway about 500 meters in, Grosse Pointe South teammates Hannah Meier and Kelsie Schwartz led the field by 10-15 meters, while Erin Finn was tucked back quietly in a group behind them. Knowing that Finn was still on the road to recovery from an iron deficiency, one could hardly keep from wondering if she was up to defending her 2011 MHSAA Lower Peninsula State Finals Division 1 girls’ crown. 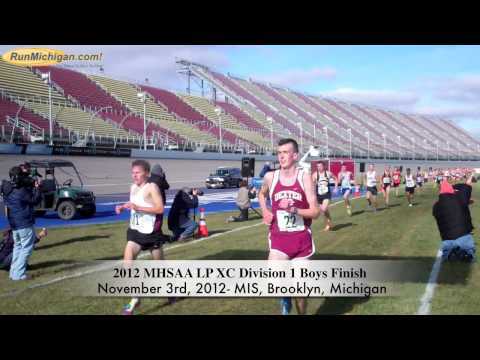 BROOKLYN – In the end, the Division 1, 2 and 3 boys’ races at Saturday’s MHSAA Lower Peninsula State Finals at Michigan International Speedway would all have winners running between 15:04 and 15:07. 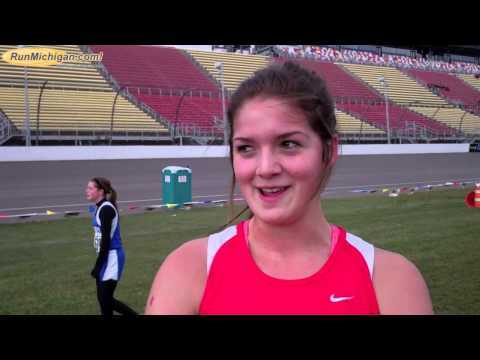 BROOKLYN, Mich. – Breckenridge junior Kirsten Olling wanted to make sure no one had any designs on taking her title away from her at Saturday’s MHSAA Lower Peninsula Final Girls Division 4 race at Michigan International Speedway. BROOKLYN – Jackson Lumen Christi’s boys coach David Miller laughed as a reporter asks him how many state titles he and his powerful boys have won now, during the Division 3 awards ceremony at the MHSAA Lower Peninsula Finals Saturday at MIS. It’s clear he’s been asked that a lot. BROOKLYN, Mich – There were the Kyle Stack-led champs of 2009. Then came the titlists of 2011, headed up by Spencer Nousain. 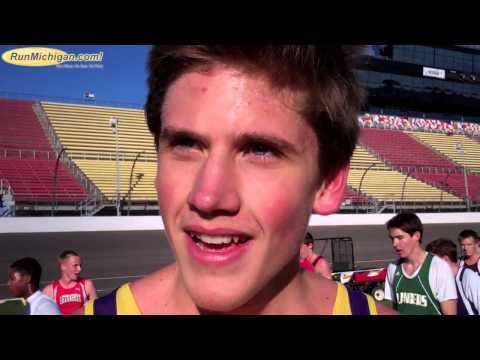 Now, in 2012, a sophomore has led them, with Jesse Hersha’s 15:32.3 ruling over the field by more than 20 seconds in Saturday’s MHSAA Lower Peninsula Final Boys Division 4 at Michigan International Speedway. http://www.runmichigan.com 2012 MHSAA Cross Country Division 1 Girls Finals Champion and Grand Rapids Christian Senior Julia Bos talks about her win at the 2012 MHSAA LP Finals in Brooklyn, MI on November 3rd, 2012 with the media. Julia ran 17:20.4 for the Girls D1 win and her second Cross Country state title. 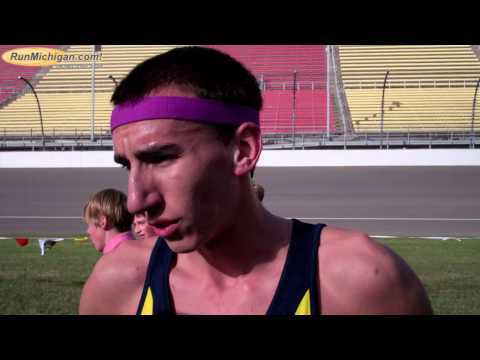 Julia also won in 2011.
http://www.runmichigan.com 2012 MHSAA Cross Country Division 4 Boys Finals Runner-up and Evart Senior David Zinger talks about his 2nd place at the 2012 MHSAA LP Finals in Brooklyn, MI on November 3rd, 2012 with RunMichigan.com's John Brabbs. David ran 15:52.8 for the Boys D4 2nd place and also led his team, Evart, to a 2nd place finish. http://www.runmichigan.com 2012 MHSAA Cross Country Division 3 Girls Finals Champion and St. Louis Senior Raquel Serna talks about her 2nd place at the 2012 MHSAA LP Finals in Brooklyn, MI on November 3rd, 2012 with the media. Raquel ran 17:59.8 in the Girls D3 race. http://www.runmichigan.com 2012 MHSAA Cross Country Division 2 Boys Finals Champion and Cedar Springs Senior Connor Mora talks about his win at the 2012 MHSAA LP Finals in Brooklyn, MI on November 3rd, 2012 with the media. Connor ran 15:04.2 for the Boys D2 win and also led his team, Cedar Springs, to a 4th place finish. Connor ran the fastest time of the day. http://www.runmichigan.com 2012 MHSAA Cross Country Division 3 Girls Finals Champion and Macomb Lutheran North Sophomore Gina Patterson talks about her win at the 2012 MHSAA LP Finals in Brooklyn, MI on November 3rd, 2012 with the media. Gina ran 17:43.4 for the Girls D3 win and also led his team, Macomb Lutheran North, to a 7th place team finish. http://www.runmichigan.com 2012 MHSAA Cross Country Division 1 Boys Finals Champion and Highland-Milford Junior Brian Kettle talks about his win at the 2012 MHSAA LP Finals in Brooklyn, MI on November 3rd, 2012 with the media. 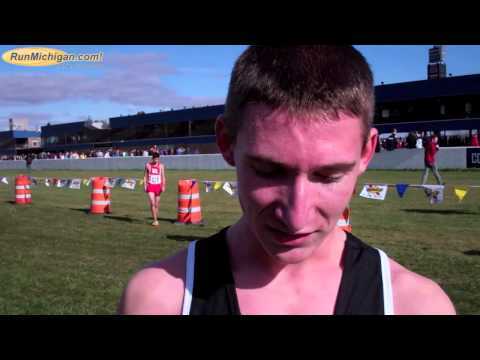 Brian ran 15:07.3 for the Boys D1 win and also led his team, Highland-Milford, to a team state championship. http://www.runmichigan.com 2012 MHSAA Cross Country Division 1 Girls Finals Champion and West Bloomfield Senior Erin Finn talks about her win at the 2012 MHSAA LP Finals in Brooklyn, MI on November 3rd, 2012 with the media. Erin ran 17:07.9 for the Girls D1 win and fastest time of the day. 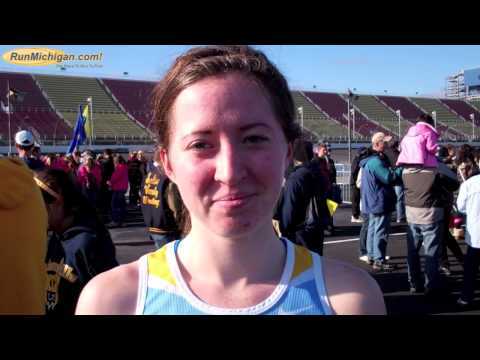 Erin also won the 2011 MHSAA Cross Country Division 1 title. http://www.runmichigan.com 2012 MHSAA Cross Country Division 4 Boys Finals Champion and Concord Sophomore Jesse Hersha talks about his win at the 2012 MHSAA LP Finals in Brooklyn, MI on November 3rd, 2012 with the media. 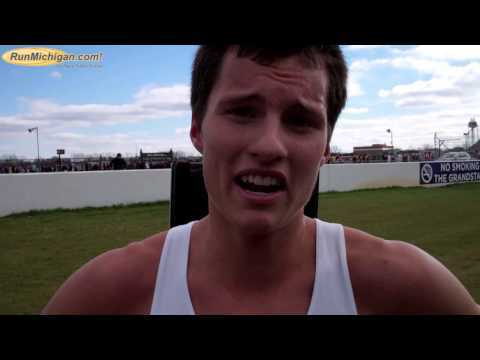 Jesse ran 15:32.3 for the Boys D4 win and also led his team, Concord, to a state title. 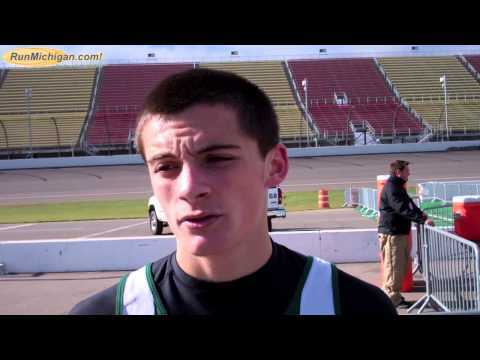 http://www.runmichigan.com 2012 MHSAA Cross Country Division 1 Boy Finals Champion and Lake Orion Senior T.J. Carey talks about his 2nd place finish at the 2012 MHSAA LP Finals in Brooklyn, MI on November 3rd, 2012 with the media. T.J. ran 15:09.4 for the a new Lake Orion school record. 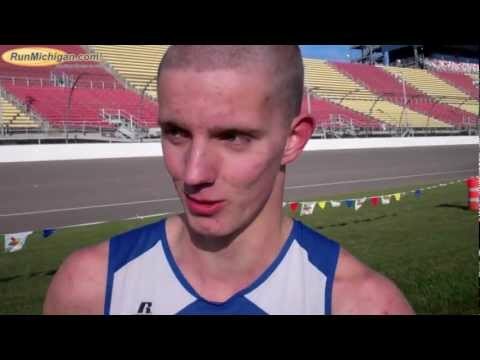 http://www.runmichigan.com 2012 MHSAA LP State Finals, Boys Division 1 Finish in Brooklyn, MI on November 3rd, 2012.
http://www.runmichigan.com 2012 MHSAA Cross Country Division 3 Boys Finals Champion and Erie Mason Senior Nick Raymond talks about his win at the 2012 MHSAA LP Finals in Brooklyn, MI on November 3rd, 2012 with the media. Nick ran 15:05.1 for the Boys D3 win and also led his team, Erie Mason, to a 16th place team finish. http://www.runmichigan.com 2012 MHSAA Cross Country Division 1 Girls Finals Champion and Grosse Pointe South Senior Hannah Meier talks about her 2nd place finish at the 2012 MHSAA LP Finals in Brooklyn, MI on November 3rd, 2012 with the media. 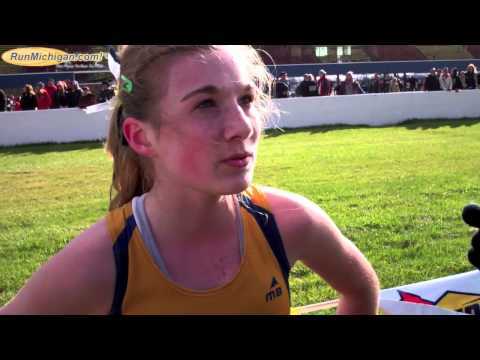 Hannah ran 17:34.5 for the Girls D1 and also led her team, Grosse Pointe South, to a 2nd place team finish. http://www.runmichigan.com 2012 MHSAA Cross Country Division 4 Girls Finals Champion and Breckenridge Junior Kirsten Olling talks about her win at the 2012 MHSAA LP Finals in Brooklyn, MI on November 3rd, 2012 with the media. 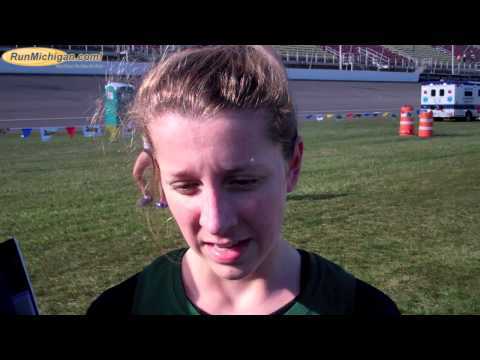 Kirsten ran 17:59.6 for the Girls D4 win and also led her team, Breckenridge, to a 10th place finish. 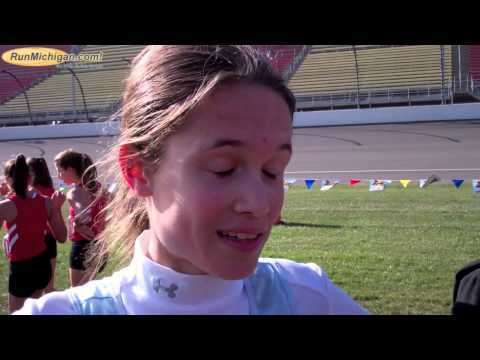 http://www.runmichigan.com 2012 MHSAA Cross Country Division 2 Girls Finals Champion and Cedar Springs Sophomore Kenzie Weiler talks about her 2nd place finish at the 2012 MHSAA LP Finals in Brooklyn, MI on November 3rd, 2012 with the media. Kenzie ran 17:49.1 and also led her team, Cedar Springs, to a 8th place team finish. 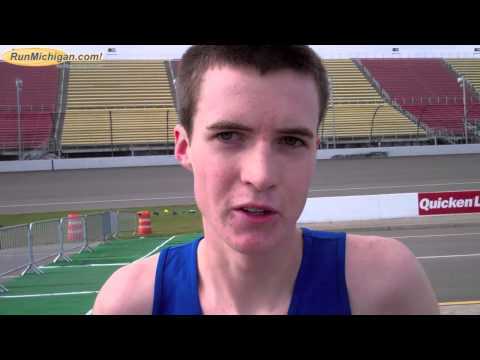 http://www.runmichigan.com 2012 MHSAA Cross Country Division 2 Boys Finals Champion and Mason Senior Tanner Hinkle talks about his 2nd place finish at the 2012 MHSAA LP Finals in Brooklyn, MI on November 3rd, 2012 with the media. Tanner ran 15:09.8 and also led his team, Mason, to a 5th place team finish.